Our team of professionals is certified to handle cycle towing. Whether you have an expensive Ducati, a modified Harley, or even a classy BMW, we can take care of it. You can expect us to take your motorcycle with care and treat it as if it was our own. 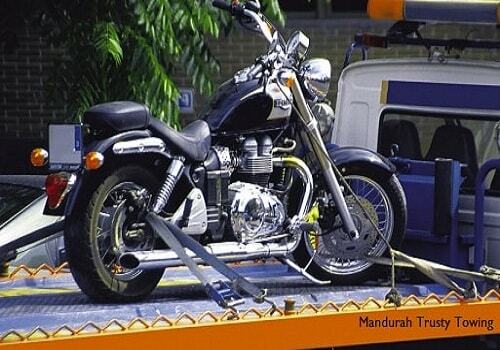 The team for motorcycle towing is different from our tow bars Perth team. We employ experienced experts that specialise in these machines. They know the specific ins and outs of these vehicles, so you can rest assured your baby won’t be taking any damage. We also have specially designated lots for motorcycles. Our holding facility is secured 24/7, so you can rest assured it is safe. Our towing services are high quality, from the moment we pick it up to the moment you get it from us. We are also tied with several insurance firms and mechanics. Our contracts allow us to keep your ride in excellent condition. Our roadside assistance and truck towing also handle a variety of related tasks. We can help you reignite your battery, replace and install tyres, or refuel you on-site. We offer our service without the need for membership fees or monthly dues. As long as you need help, you can call us. You only need to pay for any services you use and any replacement parts required.